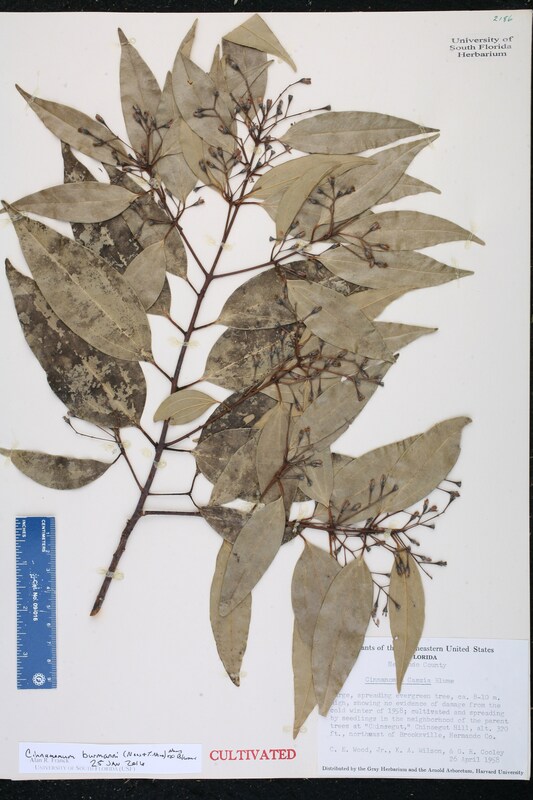 Plant Notes: Although often spelled "burmannii", Turner (2013) indicated the correct spelling ought to be "burmanni". 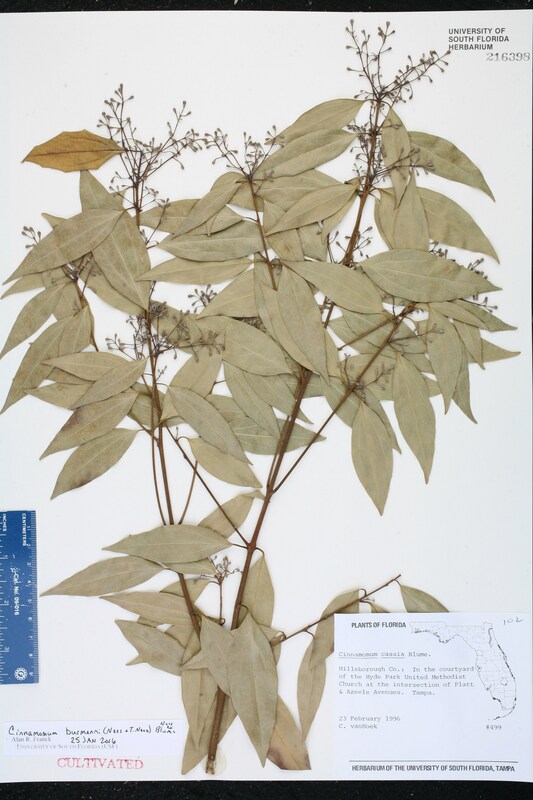 Citation CINNAMOMUM BURMANNII (Nees von Esenbeck & T. Nees von Esenbeck) Blume, Bijdr. 569. 1826. Basionym: Laurus burmannii Nees von Esenbeck & T. Nees von Esenback 1823. Type: INDONESIA: Java: West Java, s.d., Blume s.n. (lectotype: L; isolectotype: L). Lectotypified by Wuu-Kuang, Blumea 56: 246. 2011. Cinnamon kiamis Cinnamomum kiamis Nees, in Wallich, Pl. Asiat. Rar. 2: 75. 1831, nom. illegit. BASIONYM: Laurus burmannii Nees von Esenbeck & T. Nees von Esenback 1823. Laurus burmannii Laurus burmannii Nees von Esenbeck & T. Nees von Esenbeck, Cinnam. Disp. 57, t. 4. 1823. BASIONYM: Laurus burmannii Nees von Esenbeck & T. Nees von Esenback 1823. TYPE: INDONESIA: Java: West Java, s.d., Blume s.n. (lectotype: L; isolectotype: L). Lectotypified by Wuu-Kuang, Blumea 56: 246. 2011. 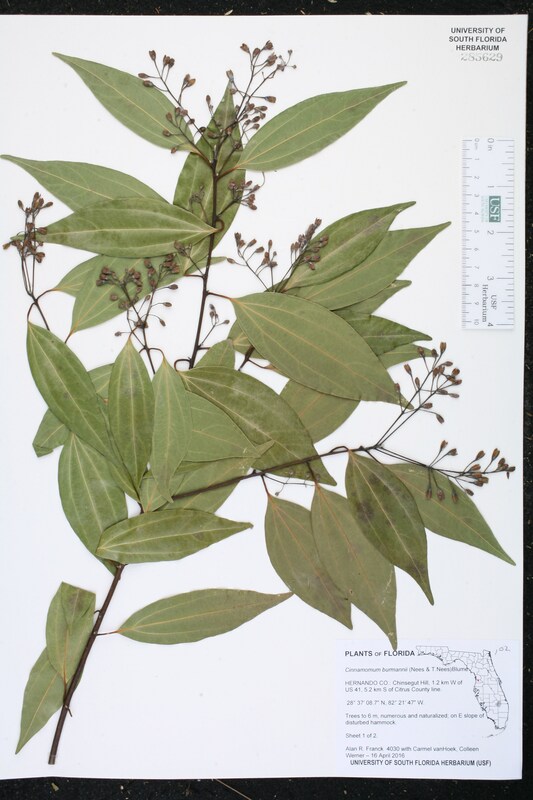 Cinnamomum chinense Cinnamomum chinense Blume, Bijdr. 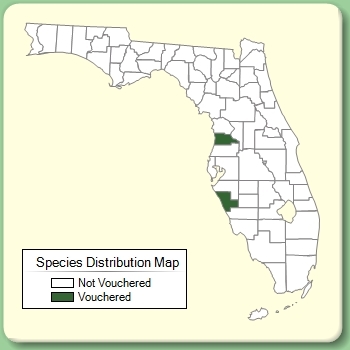 569. 1826. TYPE: CHINA: Cult. in Java, s.d., Blume s.n. 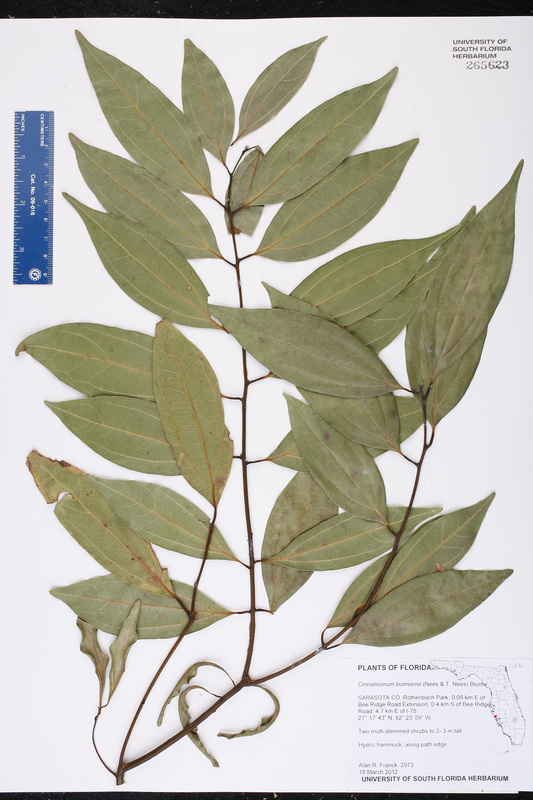 (holotype: L). 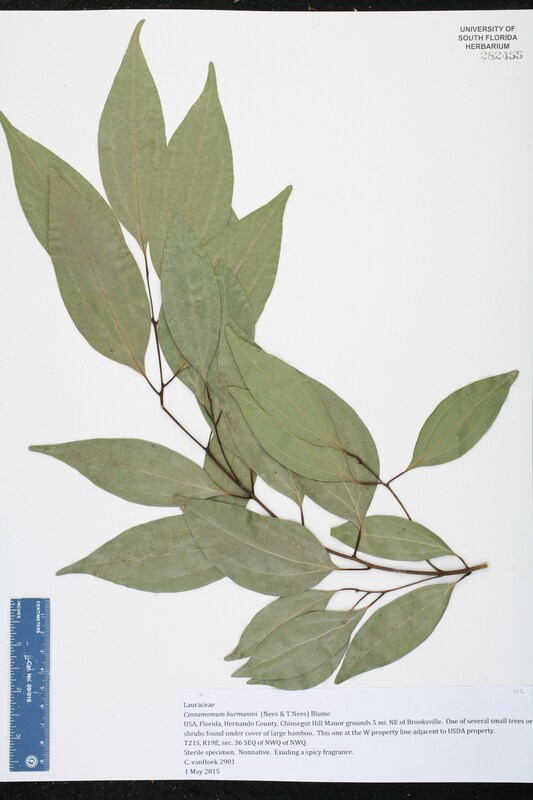 Cinnamomum hainanense Cinnamomum hainanense Nakai, Fl. Sylv. Kor. 22: 24. 1939. TYPE: CHINA: Hainan: Ching Mai Distr., Kwei Shu, Pak Shik Ling vicinity, 21 Oct 1932, Lei 151 (holotype: TI, isotypes: NY, US). 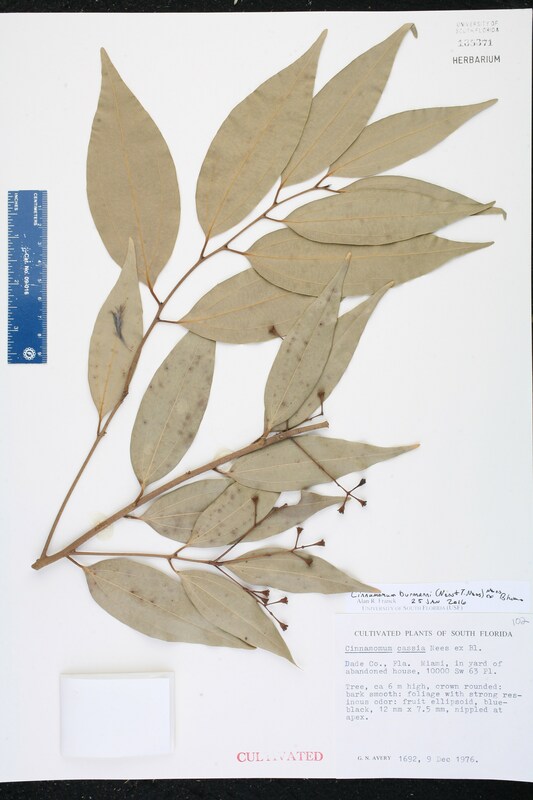 Cinnamomum macrostemon Cinnamomum macrostemon Hayata, Icon. Pl. Formos. 3: 160. 1913. TYPE: TAIWAN: Tainan, Apr 1910, Nagasawa 155 (holotype: TI; isotypes: K, L). 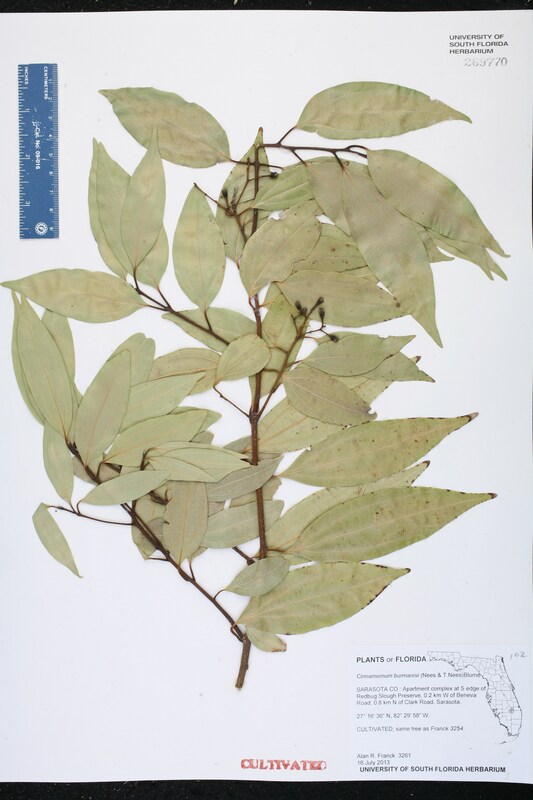 Cinnamomum mindanaense Cinnamomum mindanaense Elmer, Leafl. Philipp. Bot. 2; 705. 1910. TYPE: PHILIPPINES: Mindanao: Todaya (Mt. Apo), Distr. Davao, Jul 1909, Elmer 11105 (lectotype: K; isolectotypes: A, L, NY, US). Lectotypified by Wuu-Kuang, Blumea 56: 246. 2011. 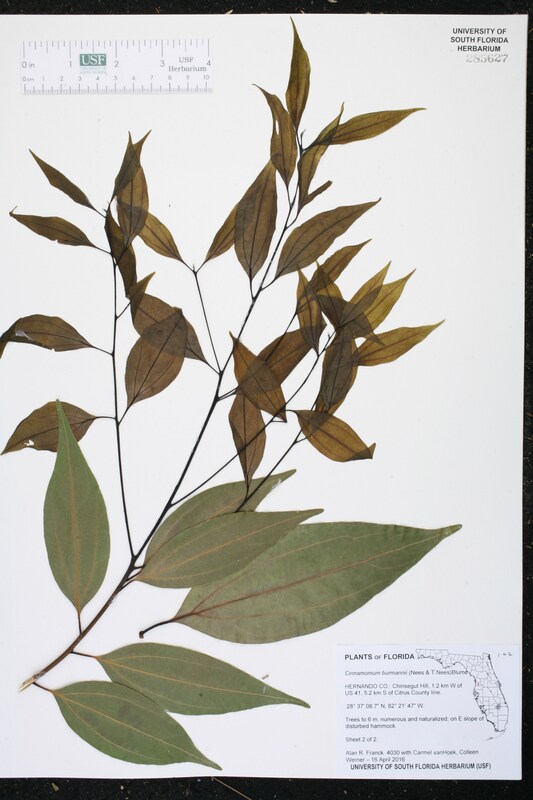 Cinnamomum mutabile Cinnamomum mutabile Blume ex Lukmanoff, Nomencl. Icon. Cannel. 12. 1889. TYPE: INDONESIA: Java: Without data, Anon. s.n. (holotype: L). Laurus dulcis Laurus dulcis Roxburgh, Fl. Ind., ed. 1832. 2: 303. 1832. TYPE: CHINA: Cult. in Calcutta, s.d., Roxburgh s.n. (= Wallich Numer. List 2581A) (lectotype: K-W; isolectotypes: BM, BR, P). Lectotypified by Wuu-Kuang, Blumea 56: 246. 2011. Persea dulcis Persea dulcis (Roxburgh) Sprengel, Syst. Veg. 2: 268. 1825. 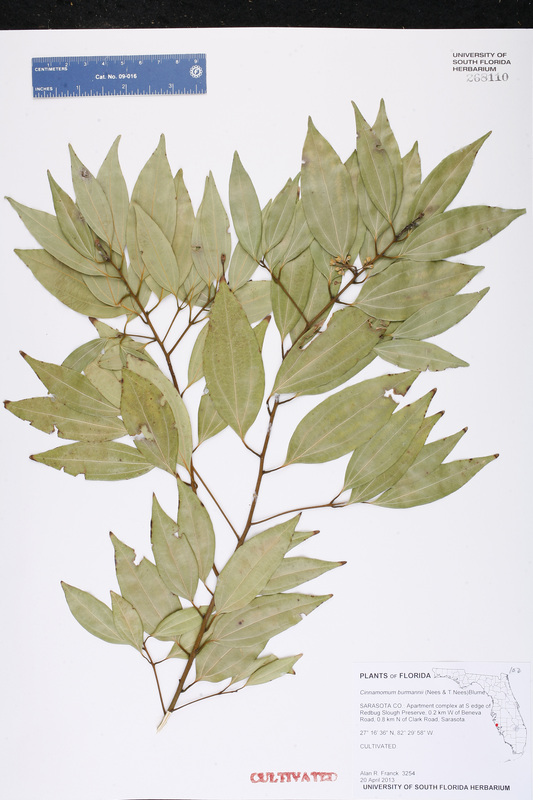 BASIONYM: Laurus dulcis Roxburgh 1832. USA Florida Sarasota Co. 20 Apr 2013 A. R. Franck 3254 CULTIVATED. USA Florida Miami-Dade Co. 09 Dec 1976 G. N. Avery 1692 CULTIVATED. USA Florida Hernando Co. 26 Apr 1958 C. E. Wood s.n. CULTIVATED. USA Florida Hillsborough Co. 23 Feb 1996 C. vanHoek 499 CULTIVATED. USA Florida Sarasota Co. 16 Jul 2013 A. R. Franck 3261 CULTIVATED. Same tree as Franck 3254. USA Florida Hernando Co. 16 Apr 2016 A. R. Franck 4030 Sheet 1 of 2. USA Florida Hernando Co. 16 Apr 2016 A. R. Franck 4030 Sheet 2 of 2.